One of the most exciting plays in football is a well-executed play-action deep ball. Packers fans have been spoiled in recent years in watching Rodgers do exactly this. Despite the cannon arm, Rodgers has shown an unbelievable touch to drop one in over the shoulder as if he were handing it off to the receiver. It’s simply a thing of beauty. 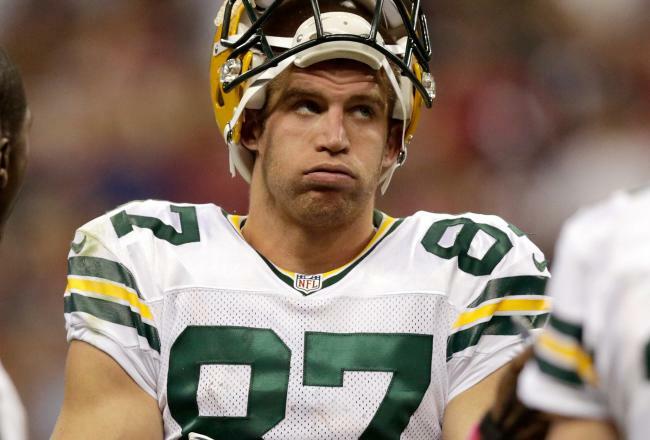 His primary target on these plays since the 2010 Super Bowl has been Jordy Nelson. Not a true blazer, Nelson has enough speed to open-up-the-top on the defense. And when necessary, he can go up and get the ball in traffic. The latter was on full display on this ridiculously tough and clutch grab at NYG last season. Together, they formed a hell of a pairing in 2011. On 96 targets, Nelson had 68 receptions (good for a 71% completion percentage), 1,263 yards, 15 TDs, and an average of 18.6 yards-per-reception. Fast forward to 2012. Nelson has 43 receptions on 63 targets (68%), 577 yards, 5 TDs, and 13.4 yards-per-reception. With 7 games remaining, the numbers are down. And the numbers mask his inconsistency – for example, he had 3 TD’s in one game. What’s the cause of this drop-off between the two? The loss of Jennings isn’t the cause because Jordy played well last season without Jennings in the lineup. Cobb’s emergence has been huge for the offense, but he is more or less getting Jennings-type production. The Packers’ inability to establish a play-action game has frustrated Jordy and the Packers offense. The drop-off can be blamed, in part, on the Packers’ inability to establish a reliable play-action game this season. The Packers thrived on the play-action last year in spite of the fact they didn’t have a running game (here’s looking at you Ryan Grant). This year, though, defenses are playing deep coverage and not biting on the play-action. The result is ugly. Through week 7, Rodgers was dead-last in the NFL in completion-percentage difference between non-play-action passes and play-action passes. On non-play-action passes, Rodgers completed 72.3% of his passes. Play-action passes were completed at a 55.3% clip. That’s a 17% difference. Amazing, isn’t it. And those stats bear out what the naked eye can see. Think, when’s the last time you saw Jordy break free past the last defender on a play-action play? Frankly, it might be 2011. The Packers force-fed the play-action deep ball at the beginning of the season to no success. Time and again, Rodgers would play-action, roll out, and even with ample time to find a receiver, no one could get open. Teams simply weren’t biting on the play-action. Defenses are begging the Packers to run. And in doing so, teams have taken away the play-action play from the Packers playbook. Adjustments are the life of the NFL. MM has realized the offenses inability to establish a play-action game and not called them nearly as often. Thankfully, the offense has evolved without it. But there’s no doubt, the play-action game is a missing threat. This entry was posted in Home, Vikes v. Pack and tagged 2012 Green Bay Packers, Aaron Rodgers, Greg Jennings injury, Jordy Nelson, Jordy Nelson bombs, Jordy Nelson deep balls, Jordy Nelson touchdowns, Mike McCarthy, Packers offense, Packers play-action, Play-action success, Randall Cobb emergence, Rodgers play-action. Bookmark the permalink.